A game that divides gamers something rotten, Nights: Into Dreams – for what it achieved – is worthy of inclusion here. To some people, it’s a pathetic hankering to the “olden days” of gaming, scoring big, joypad dexterity, learning levels and focussing strongly on non-combat offensiveness. To others it’s a masterpiece of the Sega Saturn, with great graphics, fantastic sound, and a magical level of playability that make it one of the most brilliant games ever. Thankfully, this website considers this game the latter. 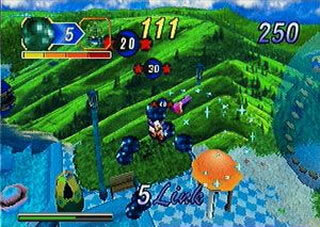 Nights was released in the mid 90’s for the fledging Sega Saturn. It didn’t turn the console around, but it is regarded as one of those hidden gems – as a game that everybody knows about but very few people played, and the fact it wasn’t a huge success make it perfect retro material. In this game, you’re in a dream world of either Claris or Elliott, who “Dualize” (as I never have the manual, so I’m unsure if they called it that or not, hence going on “Journey of Dreams” terminology) with the mystical jester Nights in their dreams. The main aim of the game is to progress through the levels as Nights, by destroying the Ideya Capture using orbs you collect, then return to the start point of the level which then progesses to the next part of the level. It all sounds rather complicated but trust me it’s simple really. Where the fun of this game comes with the unique way of scoring using “combos”. 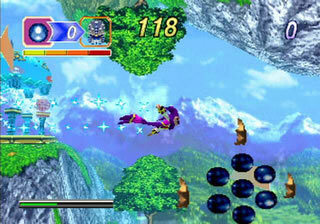 By flying through loops or collecting items, with less of a second between them, you build up combos. Attacking scores to get grades made this game popular with gamers everywhere, and the fact that you were encouraged to perform these outrageous combos to progress through the game set very well with old school gamers. The way in which this game is absolutely special is the way in which it captures the feeling of flying. Nights, just by the way in which he is animated, it’s fluid and gives a real feeling of freedom. Couple that with the beautiful scenery, and the game really takes off, as Nights is given tasks to complete, and is a utter delight to control. The final thing worth mentioning is the music score associated with this game. It wouldn’t sound out of place in any disney film, and it truly a magical piece of work. It may not be to everybody’s tastes – “Dreams Dreams” is a rather cheesy song – but a Nine Inch Nails track wouldn’t suit it. It associates with the game fantastically well. I would urge any retro gamer worth his salt to play Nights. It is one of the most engrossing, fun and beautifully crafted games ever made.